Pin It I decided to make gazpacho soup because I know that Andrew likes it. He ordered it on the day of our wedding in Hawaii. I like it as well, but it took me a few trials to get a recipe just right for my taste. I adapted many recipes together and came up with this one. 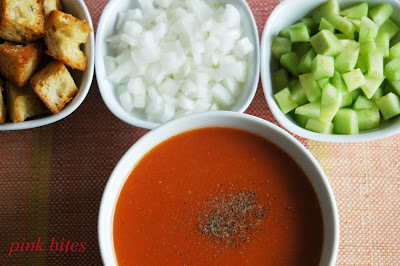 There are several variations of gazpacho soups, this is the one I make most of the time. 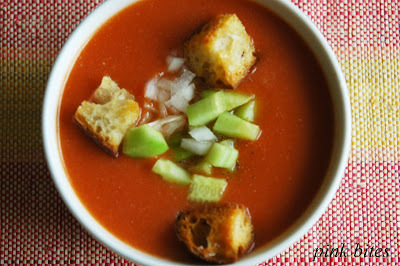 It uses a lot of olive oil which gives the soup a lovely sweetness that balances the acidity of the tomatoes. Use the best olive oil you can and you won't regret. The measurements for this soup are flexible and you should adjust them to your own taste. For instance, more bread and the soup will be thicker, less vinegar and it will be sweeter, more or less cucumber, etc. The sweetness of the tomatoes will also play a role on the final taste of the soup, if the tomatoes are not too sweet, use less vinegar. Lastly, I have to say that this recipe is quite messy to prepare, but it also makes a lot of soup, and you can keep it in the fridge for a week. Start by making the tomato juice, if making it yourself. Blend 3 tomatoes and strain it to get 1 cup of juice. You can also do this in a juicer. In small bowl, pour tomato juice over bread and let it soak until very soft, about 20 minutes. Transfer to a blender and puree until smooth. Add tomatoes, cucumber, garlic, 2 teaspoons of salt, and paprika and puree until very smooth. You may need to do this in batches if your blender is not very large. Strain through a fine-mesh sieve into a bowl, pressing on solids to extract all liquid. Discard solids, return liquid to blender (or you can use a food processor) and add the vinegar. With motor running, slowly add the oil in a steady stream, then blend until fully incorporated. 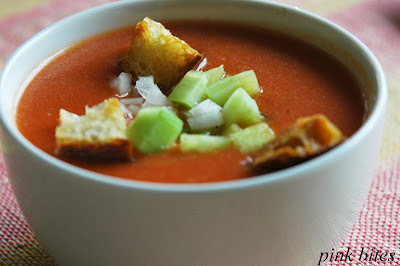 Transfer gazpacho to airtight container and refrigerate at least 4 hours or overnight. before serving. To serve, pour soup into chilled bowls, grind some fresh pepper over the soups, top with your choice of toppings and drizzle some extra virgin olive oil.